With selection No. 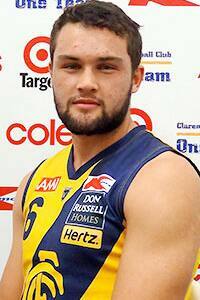 26 in the Rookie Draft, Collingwood has welcomed Brenden Abbott, a forward from Claremont. Profile: Played 15 senior matches for Claremont in the WAFL this year. Kicked 18 goals playing predominantly up forward, including a bag of five and a bag of four. Strong-bodied aggressive forward with a ferocious attack on the ball. He's capable of taking a strong mark and is a thumping left-foot kick. Would make a bullocking midfielder at AFL level. He applied himself well at Claremont this season. Derek Hine Says: Brenden Abbott’s a little bit of a project player for us, he’s had limited exposure to the system. He comes from Albany in Western Australia and he’s good friends with Marley Williams, so there’s a little bit of an association there. Having only played the game for two years, he’s really powerful and has just got a really natural talent. We’re going to need to be a little bit patient with him because his form line will fluctuate up and down, but we feel that by bringing him in that he could potentially do some damage inside forward fifty. He’s a beautiful kick of the football, he comes in with the right attitude so we’re really confident in our program with our coaches, coaching staff and the profile of our playing group, he addresses a need inside 50 for us. We’re really pleased to bring him in. What they say: "Brendan's a powerful kid who is strongly built with explosive speed and a raking left foot. Likes the physical stuff and can play in a variety of positions including forward a lot this year. He did some damage in front of goal but is just as at home across half back. He played about 15 senior games and missed out only when he was injured. Played on the state full bacl in one game against Swan Districts and kicked five goals on him so he can do some things other kids in the WAFL can't. I don't think it's an ability thing for Brenden," – Claremont talent development officer Darcy Coffey, Inside Football, November 2014.